At Apex Social club, you can bet that the hottest acts in entertainment are performing, partying and hanging out at our Las Vegas bar and nightclub. After all, as one of the most unique hot spots in all of Las Vegas, we are always packed with some of the biggest and most sought-after stars. This is why we are so excited to announce that Machine Gun Kelly is going to be making an appearance at Apex Social Club—and it order to get ready for this big weekend, we’ve decided to reminisce by creating a list of five of our favorite songs by the artist. So, in honor of Machine Gun Kelly, here are five of our favorite songs by the artist. This rap-pop ballad was one of the biggest songs of the year when it was released as it marked both Machine Gun Kelly and Camila Cabello’s first top five songs as a solo artist. This song was everywhere and is still one of the catchiest singles that the rapper has ever released. This song shocked fans as it featured Machine Gun Kelly taking shots at his idol Eminem in one of his songs. This track was released during the rappers feud with Eminem and G-Eazy and it quickly became one of the most-played songs in rap (not to mention one of the most talked about). Most people know about Machine Gun Kelly’s rap skills, but very few people know about his singing abilities. However, thanks to “Let You Go” fans of the artist were not only able to see the performer’s singing chops, but see a different side to the performer. This song was a softer track and one that had a more rock-vibe showcasing MGK’s versatility as a performer. This is the ultimate pump-up jam and one song that we just can’t stop listening to before a night on the town. Of course, we also love Waka Flocka Flame and getting to see these two artists come together on this track. This is another song that breaks the mold of most Machine Gun Kelly songs—which is why we love it so much. Fans of the performer likely know that this song is all about MGK’s origin story and how he got started. It is also a “thank you” for fans like you to commemorate how much this artist appreciates all his fans do for him. Our recommendation? Check out the music video for this song—it truly shouldn’t be missed. If you are ready to see Machine Gun Kelly, one of the biggest rappers in the industry right now, host one of the biggest party weekends of the year—then you are in luck. 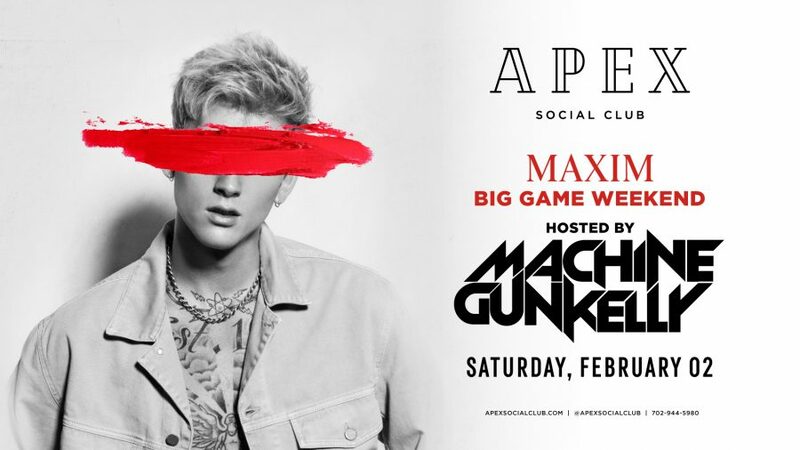 This is because Machine Gun Kelly is going to be hosting Apex’s Maxim Big Game Weekend event. Held on Superbowl Weekend, Saturday, February 2nd, it is one of the biggest party nights of the year in all of Las Vegas—and Apex Social Club is going to be representing with a non-stop party you don’t want to miss. Machine Gun Kelly is going to be hosting the evening of fun and the festivities start at 10:30 PM. So start re-listening to all of your favorite Machine Gun Kelly songs now to get yourself excited and ready for all of the action ahead, right here at Apex Social Club.